How are tropical cyclone names chosen? And why are they named? I have always known that they are named to ease the communication about them, and also that they are named in the country where they formed. But I had no reason to look up a list of tropical cyclone names, let alone to question why a particular name has been chosen, or to try predicting the next one. I now know they are not random and it's possible to know the name beforehand. 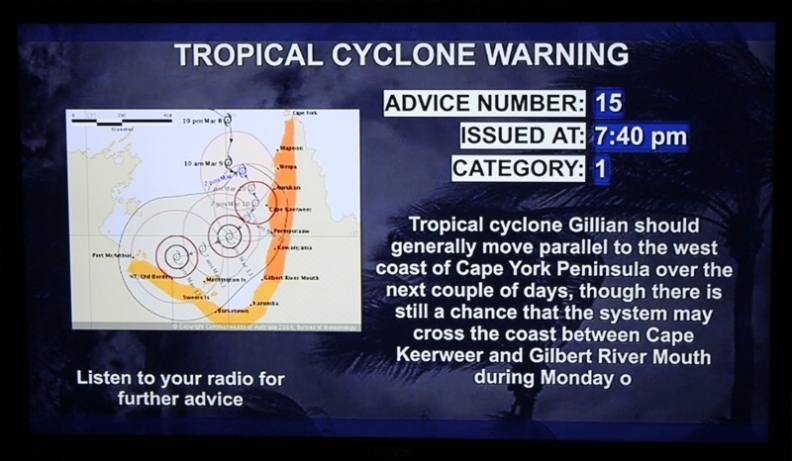 In late January 2014 when Queensland had its first tropical low of the season hovering above the Coral Sea, I started looking for information about it on the internet, and up kept coming news stories about the future Cyclone Dylan - which was going to be the name of the cyclone near Darwin earlier this season. It ended up never forming, so the name hadn't been used, and was now going to be used for our cyclone, once it formed, a few days before it crossed the coast on the early hours of 31. January 2014 at Whitsundays. That got me curious, and after a bit of research, I found a whole table of tropical cyclone names that are used one after another, and once the table is finished they start all over again! If a cyclone had enough impact, its name will be taken off the list of the tropical cyclone names (which will be done with tropical cyclone Oswald), and will not be used again. Table of tropical cyclone names (as of year 2013) by BOM Australia. Elinor, Kathy, Lance, Sandy, Margot, Winifred, Connie, Jason, Elsie, Charlie, Herbie, Ilona, Delilah, Ned, Orson, Pedro, Felicity, Ivor, Joy, Mark, Ian, Nina, Polly, Tina, Oliver, Roger, Annette, Naomi, Pearl, Sharon, Agnes, Bobby, Violet, Warren, Barry, Gertie, Celeste, Ethel, Fergus, Kristy, Olivia, Justin, Rachel, Rhonda, Katrina, Sid, Thelma, Rona, Vance, Elaine, Gwenda, John, Steve, Tessi, Rosita, Sam, Abigail, Chris, Erica, Inigo, Monty, Fay, Harvey, Ingrid, Clare, Larry, Glenda, Monica, George, Helen, Hamish, Laurence, Magda, Carlos, Heidi, Jasmine, Lua, Oswald, Rusty, Ita, Lam, Marcia or Debbie - there won't be a cyclone with your name, because there already was one, and it was big enough that the name was retired from the list of tropical cyclone names. Yasi is not on the list, that's because it was not named in Australia. The country in whose waters a cyclone forms, is the one responsible to name it. Some countries also choose to rename the cyclone that moves into their waters. Australia does not, otherwise Yasi would have been called Cyclone Bianca (because it happened right after Cyclone Anthony, see the table). If a cyclone moves west from Australia and out of our waters, it will be renamed by the Bureau of Meteorology of the Mauritius island. Cyclone Oswald was one of the strangest cyclones we have had. It moved from west to east (the opposite is far more common, due to the Earth's rotation), it made two landfalls, and the system hung around for a very long time for a cyclone. But more than anything, it was only category one and ended up becoming the deadliest Australian cyclone of this century, "thanks" to the extensive floods it brought to south eastern Queensland. There is two kinds of cyclone impact - the wind damage, and the floods from the rains it brings. A low pressure area - so called tropical low - developed over the western Gulf of Carpentaria on 17. January 2013. The system made its first landfall on 19. January near Borroloola, before becoming a cyclone. 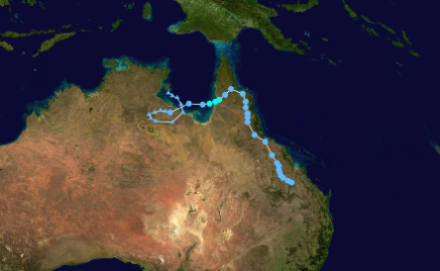 Cyclone Oswald's path by Keith Edkins, Wikipedia Commons, background image by NASA. Above the land, it made a loop (unlike many other systems that die off quickly as they loose power), and entered the area above the Gulf waters again. 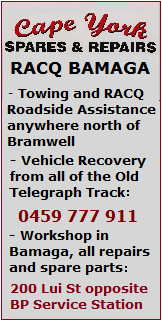 There, it quickly gained power and developed into the category one tropical cyclone Oswald. 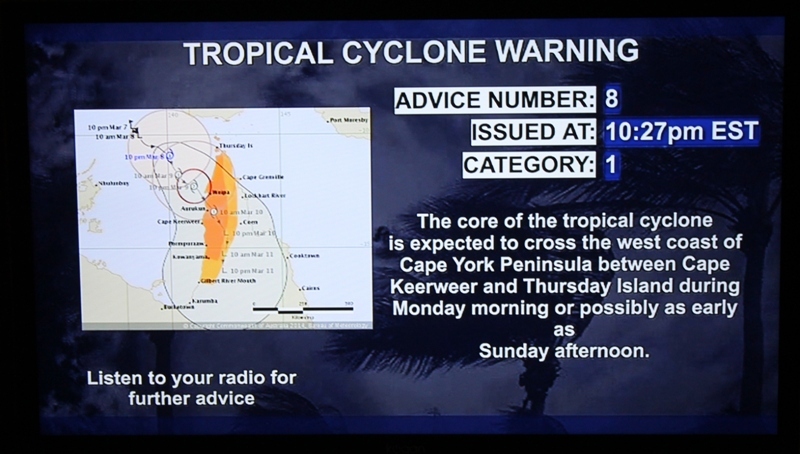 It moved east, and made its second landfall near Kowanyama in the south western Cape York. It then crossed the peninsula and turned into a tropical low again, but did not go out to the ocean on the other side. Instead it started moving south along the coastal Queensland, bringing lots and lots of rain. Up in Cape York we didn't even get that much, but further south it brought some huge rains - peaking in Tully, and totally isolating Ingham as the roads got flooded and closed. By now we thought sure it's time for it to disappear like every other cyclone, but no - the ex cyclone Oswald continued its path to south eastern Queensland - an area very prone to floods. The area was the home for the famous 2010-2011 Queensland floods, and as it now turned out, also for the 2013 Queensland floods - brought by the ex cyclone Oswald. The system didn't die off until 29. January 2013, and the floods killed six people making Oswald the deadliest cyclone since 1999. 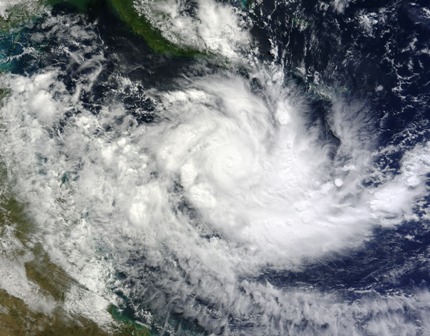 Cyclone Zane was the first May cyclone in about 70 years. Just as we thought that the 2013 cyclone season was well and truly over, a tropical low formed south of Papua New Guinea, and on the 27. 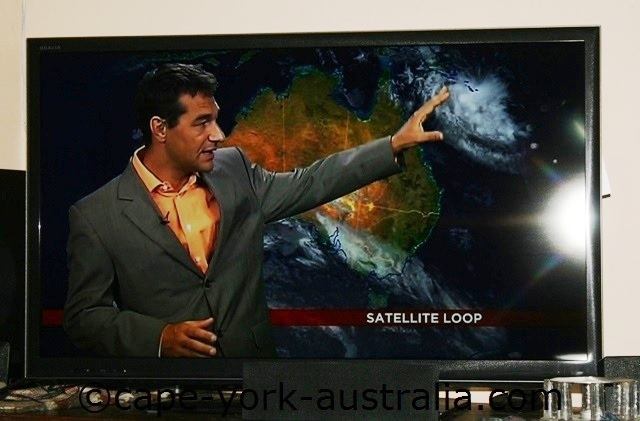 April 2013 news broke in Australia about a cyclone to be formed in a few days time. As predicted, Zane formed on the last day of the official cyclone season, to be the first cyclone to hit in the month of May since the 1940s. It was first prediced to be weak, then gained power and turned into a category two, and was predicted to grow to three, before it finally weakened to a tropical low before even getting to the coast. The late season waters were simply too cool to power it. 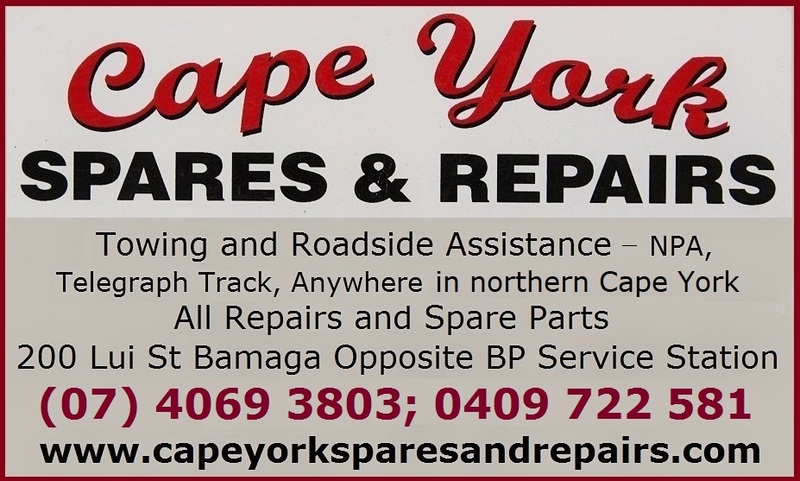 Lyckily for Cape York travellers, Cyclone Zane finally ended up pretty much not bringing a drop of rain, and after a nervous wait Cape York was open for travellers. Cyclone Zane. Image by NASA. 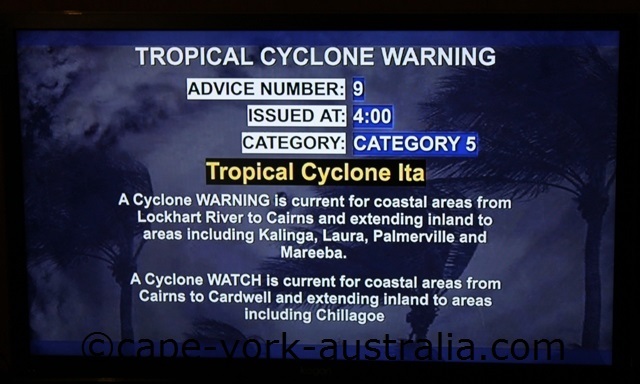 A lot of people contacted me saying they are coming up to Cape York in June or July, will the cyclone impact be gone? The answer is YES - a cyclone impact never lasts for months into the Dry Season. Cyclone Gillian was definitely one to get around. We have the Queensland cyclones, and we have the cyclones of the Northern Territory and Western Australia. There is an occasional system that comes from as far as Fiji and actually still lasts until Australia - but very rarely do we have a cyclone that moves the whole way from Queensland to Western Australia. Gillian did that, and it also visited the southern Indonesian islands Java and Bali (as a low pressure system at the time). By the time it left there, it was back into a cyclone for the third time before it was onto the Australian Christmas Island and southern Indian Ocean. It then turned west across the Gulf and threatened the small communities on the other side, before turning into a tropical low, taking off north, turning into a category one again, then a tropical low again, and heading west across Arafura Sea, Timor Sea, and Bali and Java islands. And finally it turned south to Christmas Island as it reformed into a cat one cyclone - before gaining power and turning into a two, three, four and a mighty five, before it finally gradually lost the power and disappeared on March 26 - almost two weeks after the day it formed and after travelling thousands of kilometres from the Gulf of Carpentaria to southern Indian Ocean. You may also like to read about the severe tropical cyclone Ita - it was too big a page to fit in here.